There’s a stark contrast between the gentle respect wolves show their pack mates and the aggressive way they react to other packs. The author describes the effects of seasonal hormones on pack aggression—including a few surprises about gender differences, pack size, coat colors and the “old wolf” advantage. into the wolves’ progress revealed several packs thriving and adapting to a dramatically changed habitat there. Scientists can learn much from the domestic dog’s closest genetic relatives; by studying wolves and dogs, they discover some effects of domestication on “man’s best friend.” This Austrian study looked at the way human-socialized animals of both species use information to solve problems, and the results are not what you might expect. Download full article. impressive 1,729 in-classroom presentations have been made to 42,746 school children. To understand the program’s impact on kids, our staff took before-and-after surveys to gauge how much children knew about wolves and what they learned in the classes. We also measured the attitudes that young people had about wolves before and after the program, and the results have been nothing short of impressive. During the winter of 2017-18, arctic pups Grayson and Axel, International Wolf Center ambassador wolves, were in transition from yearlings to adults. The pair engaged in wrestling, scruff bites and tail-pulling behaviors as young as three weeks of age. A casual observer might think the pups were displaying play behavior, but from an ethologist who studies wolf behavior, you’ll hear a different interpretation. From Paris to Tokyo, from the Rocky Mountains to the Kremlin, Isabelle Dee knows how to travel the world—and everywhere she goes, her excitement for wolves travels with her. Environmentalists across Europe are speaking up for the wolf, which is increasingly caught in the policy crosshairs of enraged farmers and shepherds. The European Alliance for Wolf Conservation, a group of non-governmental organizations from Spain, France, Portugal and Belgium, met in December to attempt to convince the European Commission of the need to protect this predator, which members believe is too often blamed—and killed—unjustly. be happening in other countries where fingers point at wolves, according to the pan-European media Euractiv.com. In Spain, where culling is authorized if attacks are recurrent, the environmental police in 2016 found livestock herders falsely claimed—with the complicity of foresters—200,000 euros (about $250,000) in compensation for wolf attacks. This was one of many examples of wolves being falsely blamed for predation. The British Telegraph reports a wolf is believed to have gone on a killing spree, after several sheep and a goat were found dead in the Odenwald forest. The forest extends over parts of Hesse, Baden-Württemberg and Bavaria—places where wolves were thought to be extinct. Amid calls for hunting the animal, the Hessian State Office for Nature Conservation, Environment and Geology, along with other environmental groups, has called for calm, saying there is no evidence of a single “problem wolf” scouring the forest, while noting that the livestock paddocks involved were not properly secured. A national wolf management plan was rejected here last December after being sidelined for two years. A wolf management plan has earmarked 40 wolves for culling in 2018 as the farmer-predator controversy continues there. The plan proposed to compensate 80 percent of the cost of preventive measures used by farmers, such as guarding dogs, fencing and additional shepherds. Belgium recorded its first wolf in 100 years—“Naya,” collared in eastern Germany as a six-month old pup by staff from the Technical University of Dresden. In January 2018, at 18 months of age, she completed a three-month walk-about that took her hundreds of miles west, across the Netherlands and into Belgium. them and set up a breeding center at Sakkarbaug Zoo, one of the country’s largest and oldest. Officials say there are only about 1,000 wolves left in the entire country. I sat at the edge of a clearing near the sweet grass meadows watching ravens feed on the remains of a wolf kill. It was below zero, but the February sun had begun to take the sting of coldness out of my body. Water was boiling in my billie can, a primitive container. In this northern landscape the trappings of civilization are replaced by more basic, fundamental needs: warm clothing, dry feet, food and a good cup of tea. we use an ethogram as we observe our wolves because it helps us understand the reason for each behavior, and tells us what the animals are communicating. We see play behaviors, dominance behaviors and confidence behaviors in our wolves. Colorado in the early 1900s. Being successful neighbors with a wild environment is an ongoing challenge around the world. 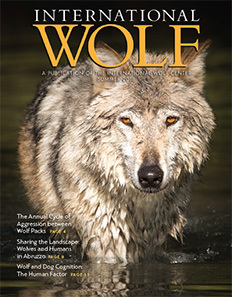 Questions and disputes arise as wolves and other large carnivores repopulate areas from which they had been extirpated, often by frightened or angry humans who feared for their safety and that of the livestock that provided their food and income. This publication has featured a number of stories about non-lethal coping strategies, from more effective guard dog breeds to fencing, electronic warning collars and other efforts.